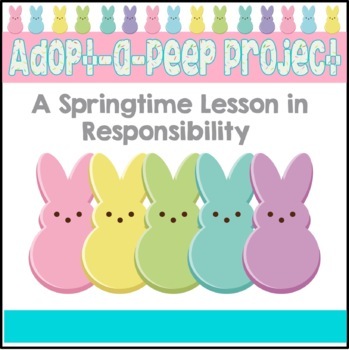 Every year around Easter my class adopts peeps. It is such a fun activity and the students LOVE it. It is also a great way to teach some responsibility. 1. Place pink and blue bunny peeps in plastic eggs (some eggs with one peep, a few with two peeps). Use one egg per student. 2. Place the filled eggs in a basket. Have each student close his/her eyes and pick an egg - don't open it yet! 3. After all students have chosen an egg have them open their eggs all together to find out if they have a girl or a boy - or twins! 4. 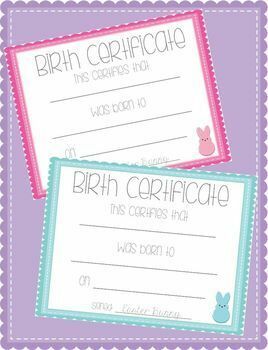 Have the students fill out birth certificates for their peeps. Students with twins get two birth certificates. 5. 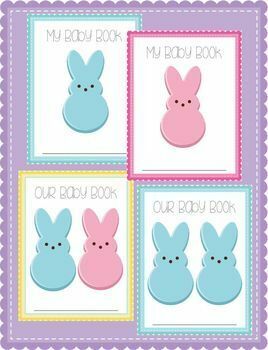 Guide the students to complete the baby book (we usually work on these over the course of a week). There are baby books available for single peeps or twins. 6. Send the parent letter home on the first day of the project. Fill in the blank to indicate how long the project will last. 7. Have fun! Have your students read to their peeps. Play lullabies so the peeps can nap. 8. Optional - you can give "bunny money" to each student. 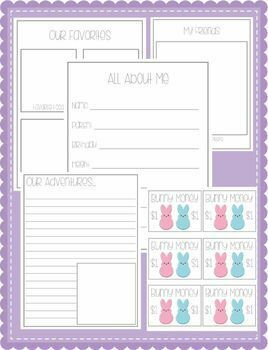 If a student needs to use the restroom or leave class, they can hire a babysitter using their bunny money. At the end of the project, bunny money can be traded in for small prizes. I tell my students that I will babysit during lunch and recess for free. *Baby Books (for twins or single peeps) w/ different covers for boys/girls/twins. I hope your students enjoy this activity as much as mine do! Please message me if you have any questions.